The Christopher Radko Down With Fur In Pink Ornament is a part of the 2018 Baby Collection. This dated ornament features a vibrant pink stocking with a festive rubber duck and a colorful pile of toys. An endearing teddy bear peeks by the stocking making it a perfect addition to the holiday tree. 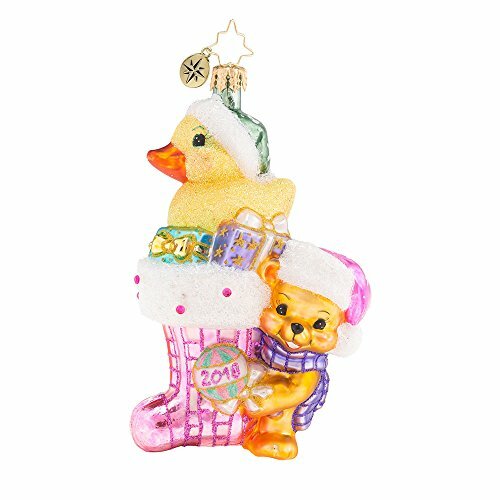 The 2018 Down with Fur in Pink Baby Girl Ornament Measures 5.5"H. x 3.5"L. x 2"W.
This Dated Ornament Features a Vibrant Pink Stocking with a Festive Yellow Glittered Rubber Duck and a Colorful Pile of Toys. There Is a Ball On the Front Of the Ornament That Is Dated With 2018 In Pink Glitter. The 2018 Down with Fur in Pink Baby Girl Ornament is a Part of the 2018 Christopher Radko Baby Collection.